Based on Tracy Letts’ Pulitzer Prize winning play, Streep and Roberts reunite after many years having played opposite one another in Steel Magnolias (both receiving Academy Award nominations for their roles in this). When a once renowned, heavy drinking poet disappears, the estranged family descends on their home, his cancer suffering and prescription drug addicted wife the center of what becomes the explosion of many pent up family frustrations and conflicts. I think this may have been more effective as a play, the focus in this movie version lying on the performances of the actors. 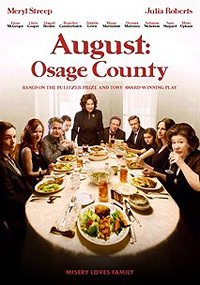 Inside an overtly comedic and satirical context like Everybody Loves Raymond or Family Guy, situations can be perceived as outrageous and funny, but there is very little underlying humour for me in August: Osage County (even if intended), merely feeling like a glimpse into a very sad, fragmented family unit - perhaps if you're in the mood to analyze acting performances, not when you're in the mood to be entertained.